Don't forget to enter the TJNL Giveway for day 9! If you win - these could be yours! Today's sponsor is I Brake for Stamps. To enter the giveaway for today, simply leave a comment on Pat's blog entry letting Pat know that you would like to enter by 11:59pm EST on Wednesday, October 10th. I love this. As soon as I saw the grapes and the wine glasses... oh my God... I spent one year creating a scrapbook about a trip to Argentina and the theme was vineyards and wine and all that... and it was very difficult to find embelishments. Now I see this... I would use it a lot. 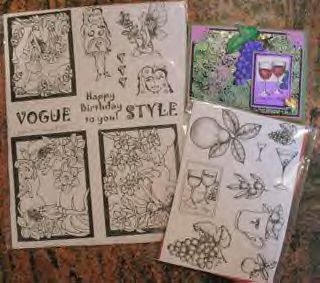 I have a group of friends and we meet monthly for a Wine, Cheese and Scrapbooking activity I created. Please I want to participate. Thanks. Edelmira Rivera.